What happens when customers visit your site and want to buy an item, but it is out of stock at the moment? You will lose that customer if you don’t do anything. 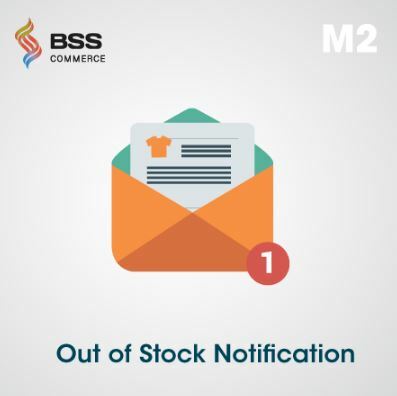 Magento 2 Out of Stock Notification by BSSCommerce is the solution to your issue. 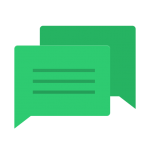 The extension allows customers to sign up to stock alert, so they can get a notification email if the product is back in stock. 1.1 Does Magento 2 support stock notification function? 1.2 How can Magento 2 Out of Stock Notification Extension benefit you? Out of Stock Notification for Magento 2 extension displays an additional email field for customers to subscribe to the out of stock products. When the items are back to stock, the extension automatically sends stock alert email to the list of signed up customers. 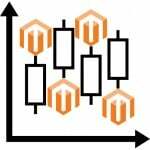 Does Magento 2 support stock notification function? By default, Magento 2 provides the stock alert function, but this feature is only available for logged-in customers. By default, guests and visitors can’t subscribe to the stock notification. Besides, the default feature doesn’t apply to child product of configurable, grouped and bundle product. 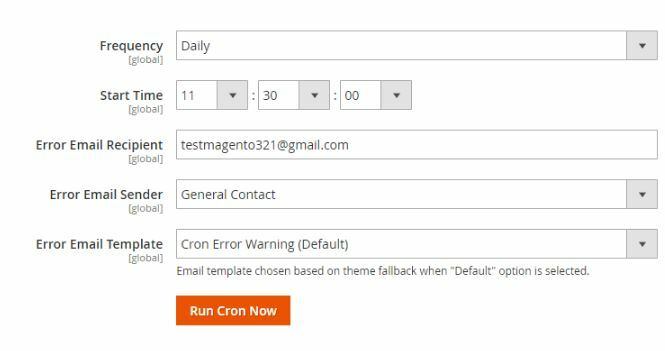 How can Magento 2 Out of Stock Notification Extension benefit you? Magento 2 Out of Stock Notification extension supports stock subscription for all customer groups even the not-logged-in customers. This extension allows customers to sign up for the stock alert of all product types, including the children products of configurable products, bundle products, and grouped products. 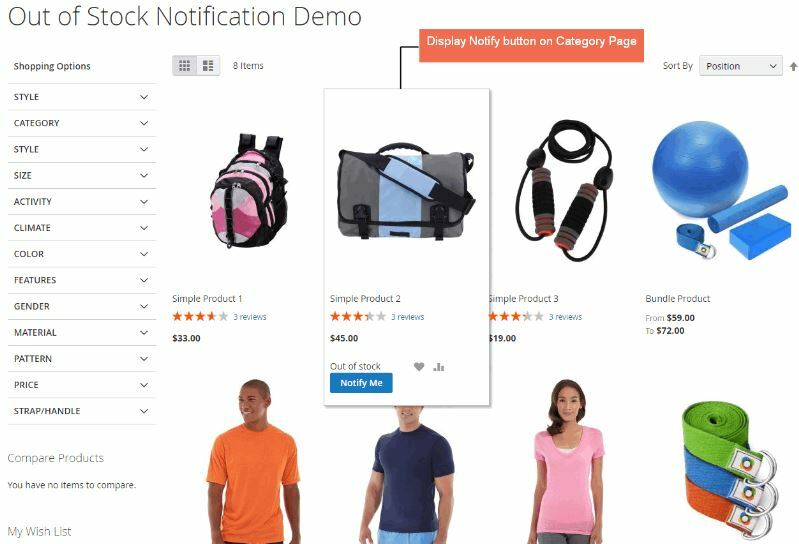 By enabling the out of stock notification function, your online shop can keep the presence of products even if they are temporarily out of stock. 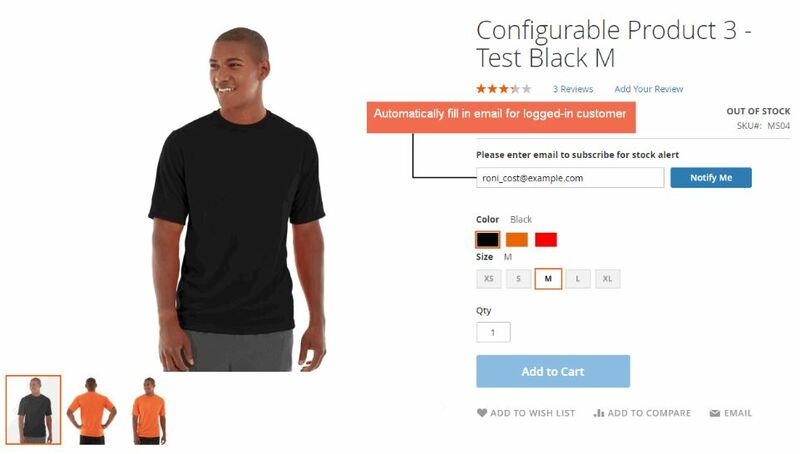 Magento 2 default automatically hide the out-of-stock items until refilled, which can make your store lose the competitiveness to the rivals. With the convenient stock alert function, customers subscribe to the stock-out products. Then, the extension automatically sends the notification email to customers when the items in their subscription list are back to stock. This quick service helps improving customer services and make them appreciate the professionalism of your store. 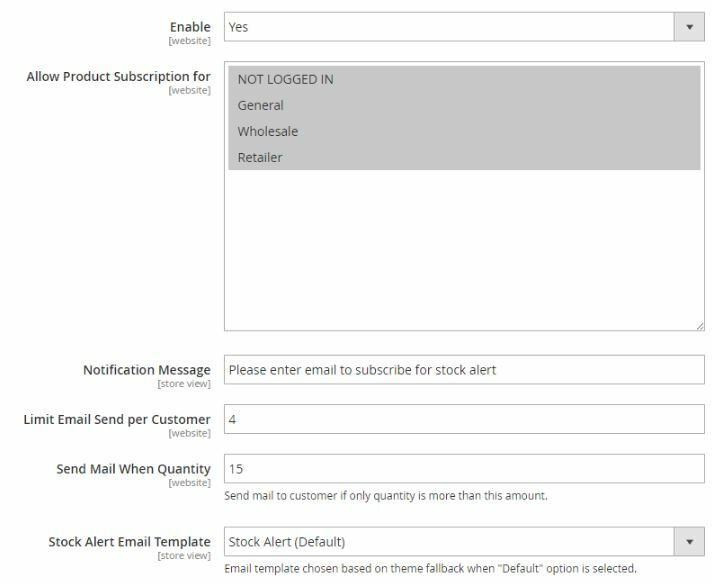 In the general configuration, you can apply out of stock function for multiple customer groups, set notification message, and execute setting for sending the stock alert email. When hovering on the product, you can see the Notify Me button. After clicking the Notify Me button, you will redirect to the product page. 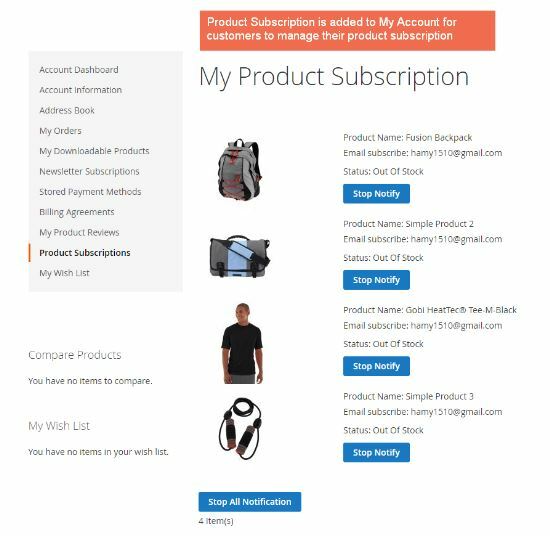 Different from the default function, guests can sign up for product subscription with the email box located on the product page. The email field is automatically filled in for logged-in customers. 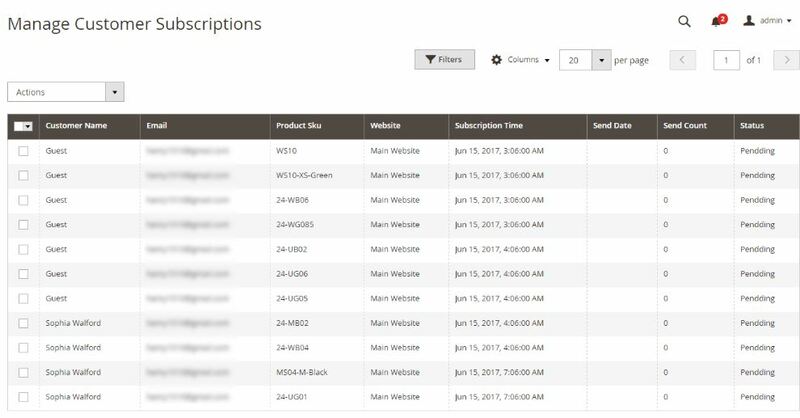 Customers can conveniently check their subscriptions in the additional tab of their account page. They can keep track of subscribed items, make adjustments and stop notification for any product here. Out of stock notification is an essential function for your Magento 2 stores to keep customers updated on the stock status of their desired products. 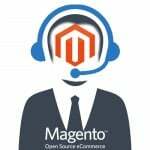 Magento 2 Out of Stock Notification extension by BSSCommerce comes with the price of $79.00 for the Community Edition and $179 for the Enterprise Edition with free installation, free update, and free 1-year support.